Alert Protective Services is Chicago’s award-winning and locally operated source for your business and home security needs. Since 1982, APS has been a leader in both, home and business security systems in Chicago land area. For over 20 years, this family-owned company has stood behind their premium products and services. Reliability is one of APS’s highest priorities. All the employees, from the owners to the operators, all live in the area and know exactly how to handle the safety concerns and problems that local residents and businesses face daily. Another benefit to working with Alert Protective Services is that there is no out-of-town management. They are known for providing the most rapid and prompt service possible. APS is always there when you need them. They provide the highest level of service to ensure the safety and wellbeing of your family and home. APS strives for customer satisfaction and loyalty. They protect every customer’s home, as if it was their own. Residents of Elmwood Park can be relaxed knowing that the professionals at APS provide excellent 24 hour-a-day service. Elmwood Park is a village that borders Chicago on the northwest side of the city. It is a part of Cook County. The village has a population of 25,405 people and 9,858 households. Elmwood Park was first known for its large Italian-American population, but recently there has been an influx of Polish-American and Hispanic residents. The median household income in Elmwood Park is $47,315. Being Chicago’s northwestern neighbor, Elmwood Park faces its fair share of crime. Last year, there was an average of 289 crimes committed per square mile in Elmwood Park. This is more than double the Illinois average of 104 and almost six times higher than the national average of 49.6. Residents should be aware of this recent rise in crime. There were 552 crimes reported last year. 514 of which were property thefts or burglaries and only 38 were violent crimes. 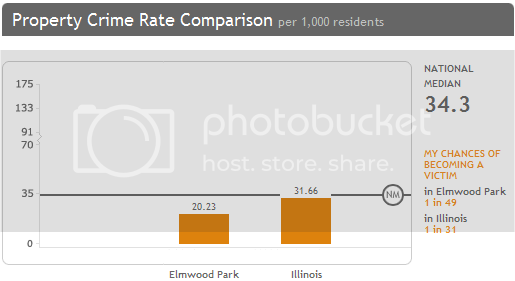 In Elmwood Park, you have a 1 in 49 chance of being a victim of a property crime, whereas, only a 1 in 667 chance of being in a violent crime. As a homeowner, you should be aware that property crimes happen far more frequently and affect a far greater number of people. An easy way to protect your home and family is to have the professionals at APS come out and diagnose your home security needs. All homes should have some form of home monitoring system in place. In a recent study done by the FBI, they found that homes with a security system in place are 15 times less likely to become a victim of a burglary. Also, most homeowner insurance policies offer discounts for homes with monitoring systems. Your security system can be one of the single most important items you purchase for your home or your business. Our experienced professionals at Alert Protective Systems will be there 24 hours-a-day, 7 days a week, with a state-of-the-art monitoring system providing you the essential peace of mind and protection you ought to have, even while you are away. The APS team of experts is also able to offer you a security system that will be both reliable and affordable for all budgets. For the kind of dependable service you can count on, call Alert Protective Systems today.